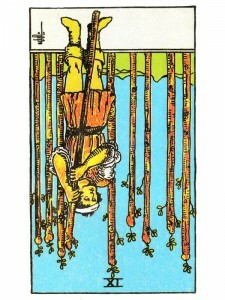 Nine of Wands (R) says your defenses have failed – your problems grow too great for your strength to hold them back. The barriers you have created to protect yourself are becoming your cage. You are giving away your self – responsibility. Seek a different approach – recognize now that your old habits make you inflexible. You have risked so much to get this far – be fearless now and move forward in relative safety. It is time for you to take your next step – take the fences down. Listen to your guides and trust your intuition. “Act” on your inspirations. Carry your experiences with you and release your fear of moving on. Do not bend under adversity or display weakness in your attitude – fight for what you believe to be right and true. Trust that you have the deep internal resources necessary to resolve any issues that might arise now. Implement your strength in those areas which will allow you to work more effectively in both the personal and professional arenas of your life. You are weighted down by the structure of your belief and support systems. You are too idealistic. The extensions of self at this point may have made you too heavy. This may show the impact of a top heavy, overly bureaucratic, spiritual organization. The image of an overweight monk comes to mind. This could show spiritual smugness, complacency – spiritual conceit. In a sense, this is quitting before you get to the end of the path, because it feels so good in this place that you do not want to leave. Also spiritual fatigue. What previous knowledge and abilities are you drawing on? What is strengthening you to face opposition? What disciplines are carrying you through? Who or what is demanding a lot from you? What task do you have to handle on your own? Next to Sun: Indicates personal or business interests in vacation areas or property. Next to Ten of Wands: Negotiations regarding real estate – building, rental or purchases. Next to Magician: Indicates a business inquiry regarding books and metaphysical interests. In the first position: The majority of your lessons for this lifetime will lie in how well you are able to help others reach your level of understanding, rather than in advancing yourself. You will be blessed with contentment at your level and well you should be content. In the second position: The proper spiritual path should not diminish or create hardship in your Physical/material Plane. In the third position: You can lighten up for awhile, let someone else take the point position. In the fourth position: To give oneself over to an ideology of spirituality at an early age may circumvent other necessary emotional development of a more personal and family nature. For a few paths this may be the appropriate karmic path – for most it is not. In the fifth position: Rather than excitement, there may be the weight of the moment and an unwieldiness until such time as your legs get strong enough for the increased load. You may literally feel heavy. In the sixth position: Some of those around you may not understand and if they are not ready and able to integrate your experience, they may react negatively and in the extreme, no longer wishing to continue their contact with you. In the seventh position: In one extreme, this resembles the plight of a fallen angel – so near God, that there is a vast amount of power residing in one’s wisdom and without availing oneself of the same amount of responsibility – big mistakes can be made. In the other extreme, fear and doubt can strike at any level and there can be tremendous fear at such dizzying heights. In the eighth position: You may be taking an important stand, important for what it symbolizes for many others and for the converts it will make. In the ninth position: This heart is overwhelmed by the immensity of universal need uncovered by higher mind and put on its doorstep. It needs time to adjust. In the tenth position: Your lesson will be in how well you can reach down and pull others up to the level you have achieved. This is your karmic purpose kicking in big time. Mike, you have asked for help, spirit has heard your cry – begin taking the baby steps to find the sources who can help you and it will be provided. I feel like I am going crazy, I am very confused. I need help.